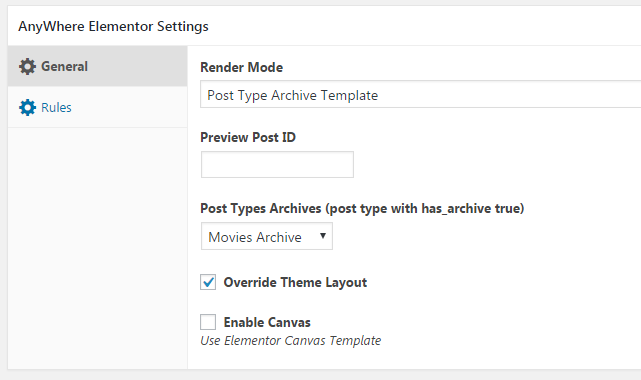 Now you can have complete control over the layout of your Blog Page and Post Type Archives. With the use of Post Blocks widget you can show your post archives in almost any design you can imagine. Override Theme Layout: Check it if you are looking for complete override of theme provided layout. Leave it uncheck if you just want to override layout of individual post item. Enable Canvas: check this option if you want to use canvas layout. Now save AE Template and start designing the page. To show the posts you can use the "Post Block" widget or you can also use Post widget of Elementor Pro. Configure the widget to show post from the post type for which you are creating this layout.